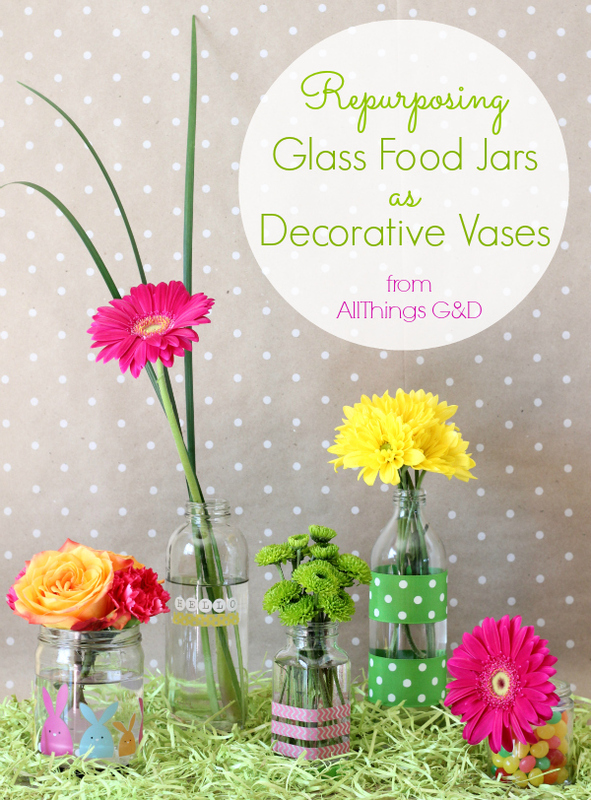 A couple of years ago I confessed I’d been coveting glass jars. Since that time I’ve been slowly transitioning our household from plastic food storage to glass, in part by reusing glass food jars. If a grocery item I purchased came in glass, I’d wash it out and reuse it for future food storage. This has been a great, environmentally-friendly and low-cost way to make our kitchen a little healthier. 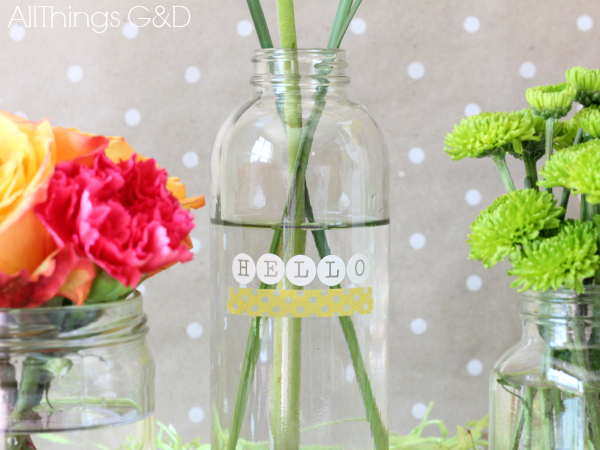 We currently have all the glass food storage we need, so lately I’ve been repurposing glass jars as decorative vases! Simply wash them out, remove their label (add some embellishments if you’d like) and enjoy! 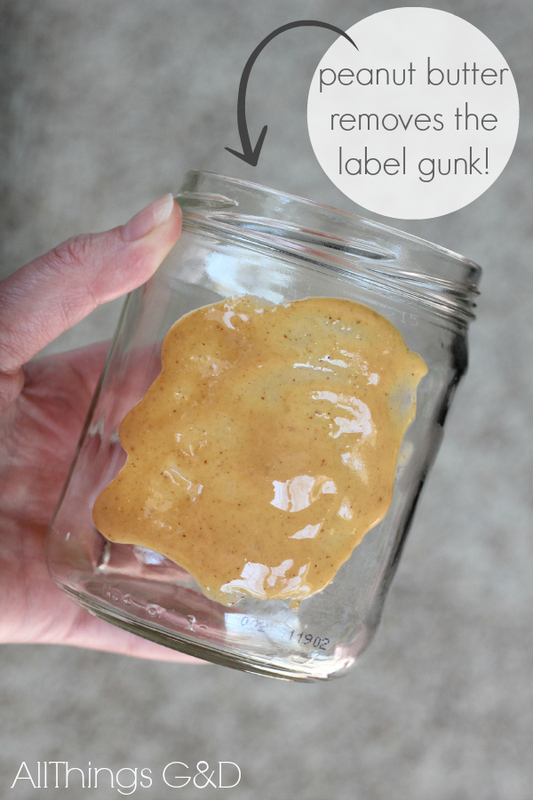 I’ve found peanut butter to be the quickest, easiest way to get the stickiness left behind from a label off the jar. Just smear it on, let it soak in for a few minutes and wash off! 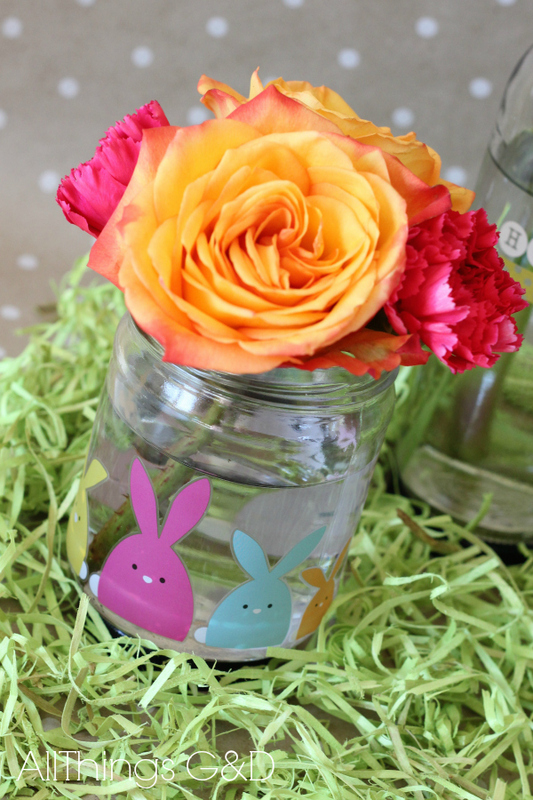 I added removable stickers to this former salsa jar for a festive Easter touch. 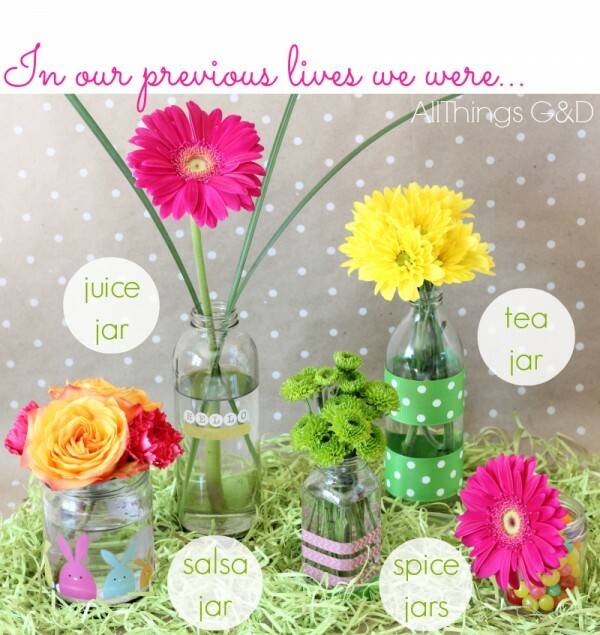 A few strips of washi tape around this former spice jar add some fun color and design. I used letter stickers from the dollar spot (underlined in washi tape) to add a friendly greeting to this former juice jar. 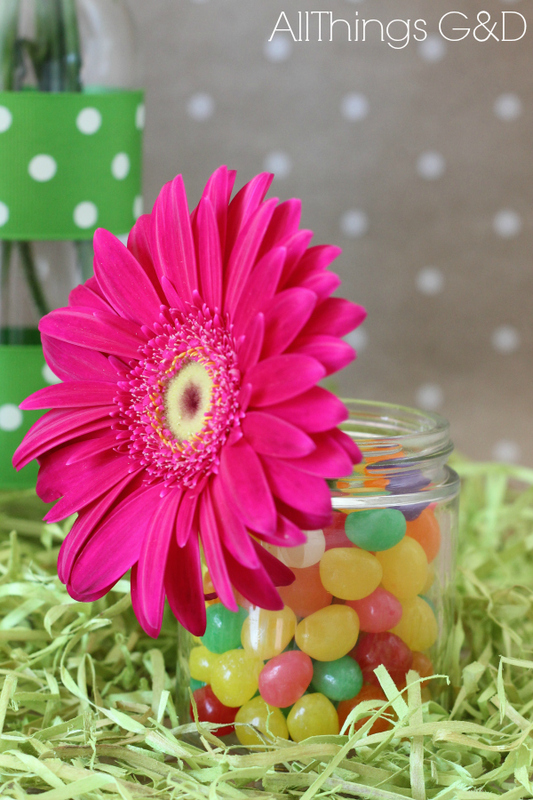 No embellishment needed for this old spice jar – just fill with jelly beans! 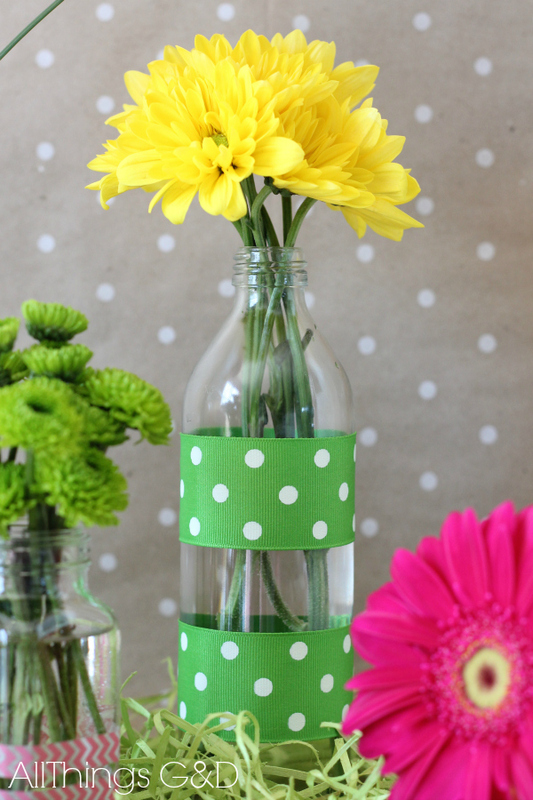 Two scraps of ribbon secured with double-stick tape are a quick and easy way to add some color to this tea jar. 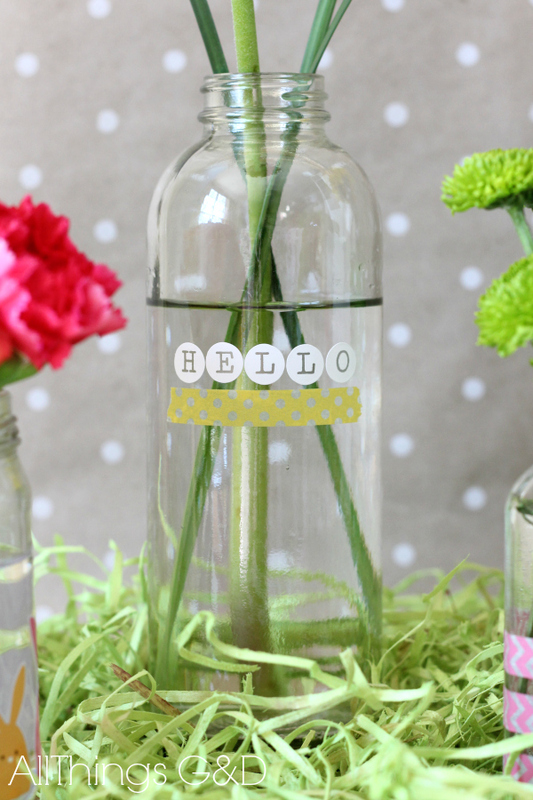 These repurposed vases are a great no-cost way to brighten your tabletop, bedside, or your neighbor’s day with some fresh-cut spring flowers. 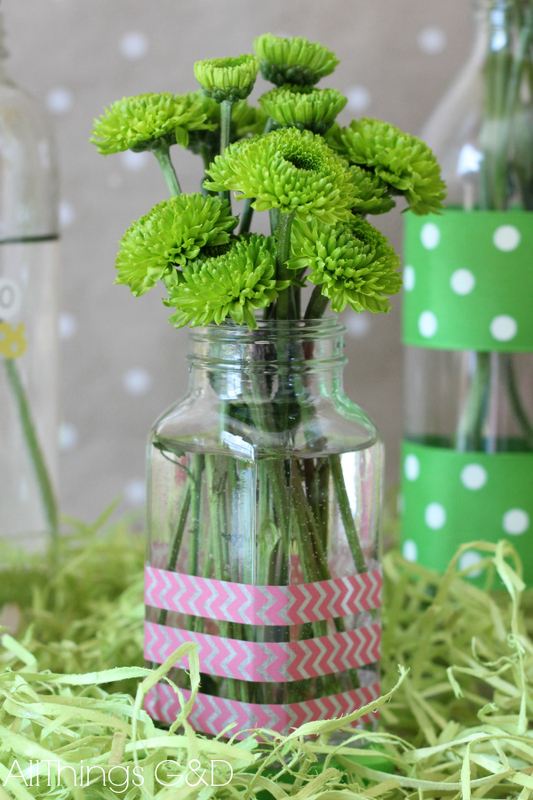 Grab a jar and surprise your hostess this Easter! Thanks for the tips! I’ve been collecting glass jars for a while now, too, but hadn’t really come up with any good ideas on what to do with them. I’ll definitely be trying the peanut butter trick, as well. I didn’t want to buy any chemicals so if I can get it to work for me, it’ll be a huge help. I’ve recently started a new Pinterest board for redecorating my office at work. This will be a very budget friendly option!